I bought an LR3 with a hitch. The key was broken in the lock and the hitch was frozen in place. Even with the lock removed, I could not get the Main Pin to retract. In the end I had to hammer the Main Pin into the housing to remove the hitch (with the lock mechanism removed). The hitch came out, but the Main Pin was then stuck in the retracted position! Operating the small top "Retaining Pin" had no effect. For a month, I soaked it in penetrating oil, heated it with torches, beat it with hammers, and still no joy. To remove the Main Pin, I had to drill a hole through the rear of the housing, and hammer a nail in there to push the Main Pin out. 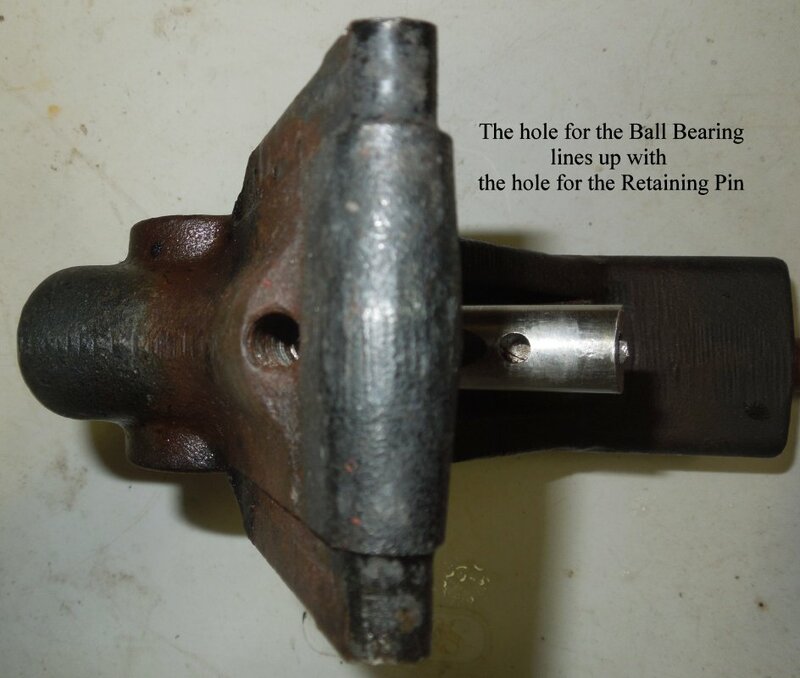 There was surface rust in the Main Pin Shaft. It took some cleaning/sanding to get the Main Pin to slide well again. I managed to disassemble and recondition the entire hitch, it works fine now, tight and solid with my 2750lb boat trailer. I was never able to find adequate info on how the hitch is put together. I was flying blind and made mistakes, so I've put together this write up for others. Note the position of everything to make reassembly easier. Push out the tiny pin that holds the green handle on its shaft and remove the green handle. 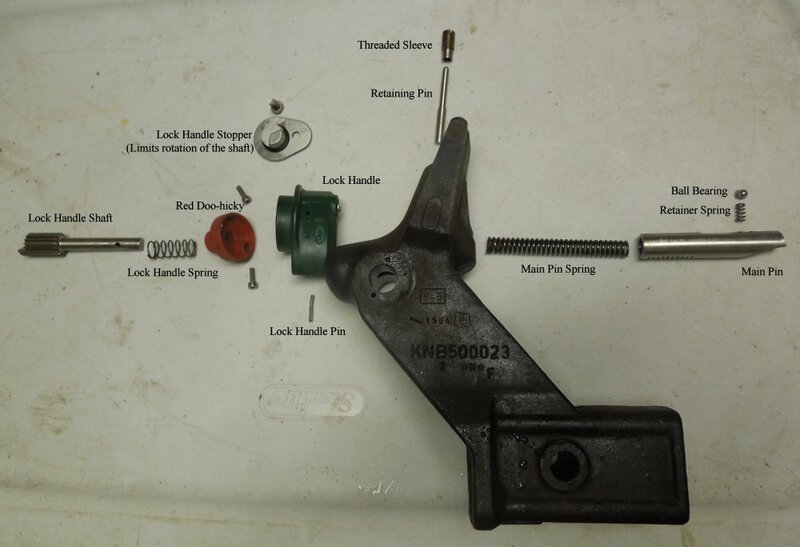 Pull the Lock Mechanism shaft and spring out. Be careful, it's spring loaded, and theres a Ball Bearing with a small Spring in the top of the Main Pin that will launch out. Do this operation in a box in case things go flying. I find it easier to hold the Main Pin in place with a clamp. Slowly releasing the clamp allows the Main Pin to come out under control. A thumb on the ball bearing when it became visible keeps it from launching. 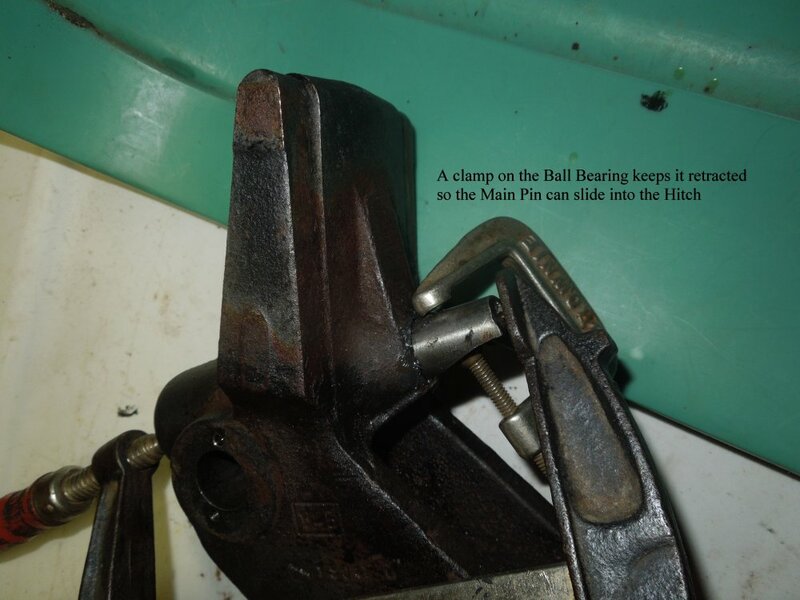 A clamp on the ball bearing helps keep it inside the Main Pin during reassembly. 3. Remove the "Retainer Pin"
This is the little pin at the top of the hitch. 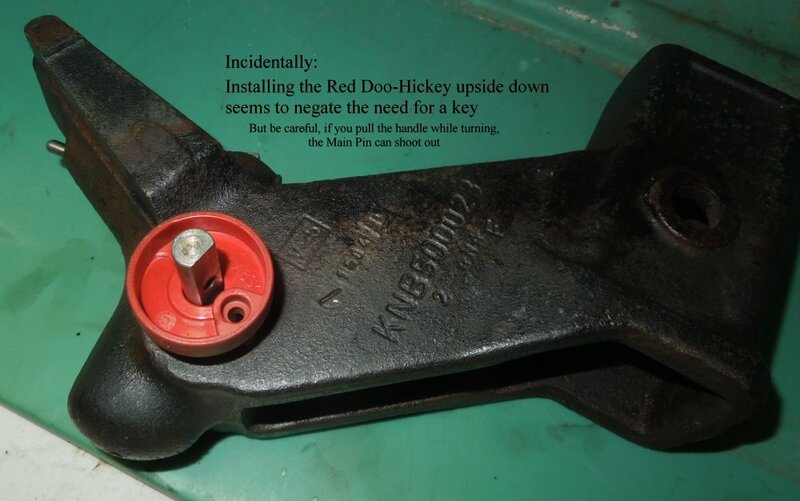 It pushes the ball bearing into the Main Pin to release it when installing the hitch. There's a threaded sleeve that keeps the Retainer Pin in its shaft. Unscrew the sleeve, remove the pin. ArmyRover and redtruck12 like this. Fantastic write up. I have a frozen one I need to get off the LR3 and get functional as well. Let me know how you make out, AR. But be careful, I may have hammered the pin in too far when removing the hitch. Great save of an expensive hitch but if you are towing moderate to heavy save your self the trouble and get a better hitch. I had mine fail after 150 miles towing a 4000 lb double axle travel trailer with 470 tounge weight. 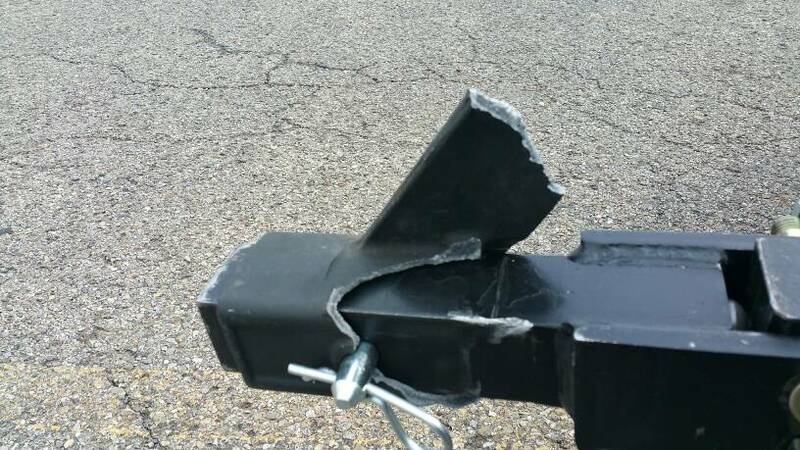 The hitch is fantastic for light trailers but cast metal seems too brittle for repeated pounding of highway towing on the expansion joints of concrete highways. Fortunately my hitch snapped and dropped the trailer pulling into a gas station and not on the highway I got stuck in a hotel for a few days untill my new hitch arrived from e-trailer. Put on the Curt hitch and towed another 4700 miles without a problem this summer. Thanks Jon. I've inspected the cast iron closely for any signs of fatigue, and all looks good. I am looking for a reasonably priced 3rd gen hitch to replace it. Fortunately I literally live next door to the boat launch, so long treks with the trailer are unlikely. Evert bit of fractured metal was bright. No sign of previous damage. Woa! That's the worst I've seen yet, Jon! Other broken hitch pics showed clear signs of old cracking, and only broke on the pillars. Looks like you had the same plow hitch as mine. I have been researching other hitches. I haven't yet heard of the short hitches breaking, but then I'm a new owner (since feb). The Mitch Hitch and similar ones like AB's hitch look like they might need periodic retorquing. Do you have any issues with the spare tire or ground clearance on your Curt hitch? Maybe I'll just focus on getting it off the truck and throwing it away lol. Might be better to get one of the welded steel bolt on's. When I get my hands on another 18" wheel and tire I will have the spare up on the roof rack until I get a swing away set up for the back. I was in discussion to buy one but i didnt know how much deeper than the pin my hitch set up was going to be and i thought it might hit the frame. 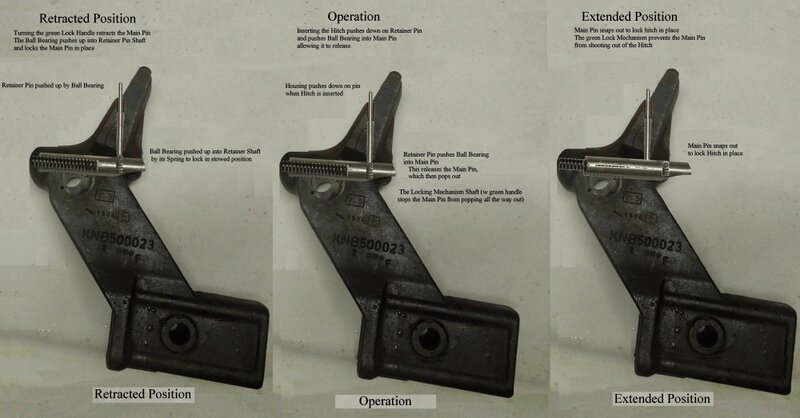 differentialpartsus has a facebook page and a website but no info re the Rhino Hitch. Looks like they specialize in differential rebuild kits. The Rhino looks similar to the Atlantic British hitch, or the Mitch. The Recovery hitch from Australia also looks similar. If the bolts keep their torque they should be OK.
"Spare tire is a 285/60-18 General Grabber AT2 that I had to squeeze in there and did not fit with stock hitch. With the Rhino the only item that protruded was the 'key'. A simple alignment of tire tread with key and tire was coaxed into spare cavity." I bought one of these last year, and had similar problems with it. I think the previous owner had stripped it down and rebuilt it incorrectly. 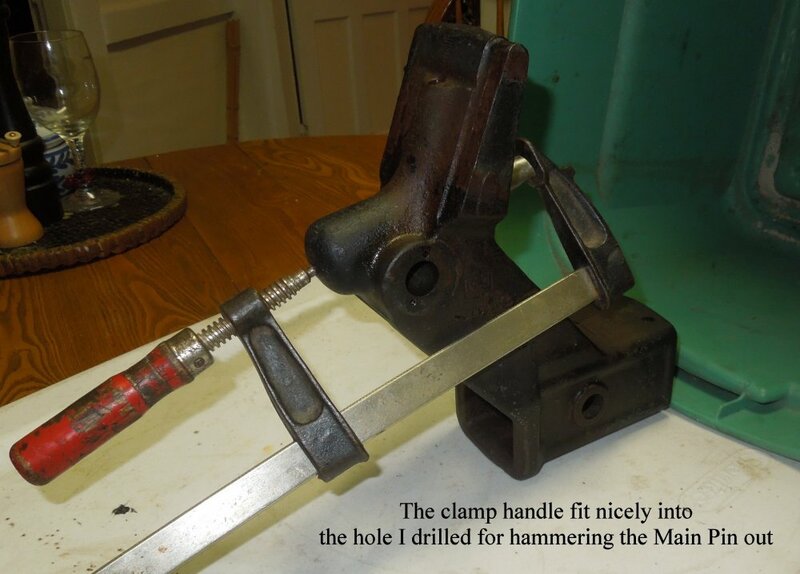 In my own rebuild I used a clamp to press home the piston but also added a hose clamp to keep the ball bearing depressed while I push the piston home. The springs for the piston and the bb are very strong so the clamps are essential.